Outdoor Travel Japan - Why Hokkaido? What distinguishes Hokkaido from other international destinations? Skiing / Snowboarding - Great snow at a great price in a magical place. Hokkaido is surrounded by three seas & lies directly in the path of massive Siberian low pressure weather systems. Loaded with moisture, these systems hit Hokkaido & are forced over the mountain ranges losing the ability to hold moisture. Hokkaido becomes the recipient of the coldest, driest maritime snow pack in the world. Snow enthusiasts come in many shapes & sizes… professionals with precious minutes to spare… ski bums who chase winter all year round…families wishing a white winter wonderland for their kids to experience. What unites them all is the quest for reliable snow not too far from home. Hokkaido Japan is the obvious choice. From within Asia, direct flights can have you in Sapporo on the same day, as compared to long haul flights to North America or Europe. From there it is only a few short hours by coach to access what the Japanese themselves call the country’s best skiing. What’s more is that a return flight costs roughly two thirds of an airfare to North America or Europe. 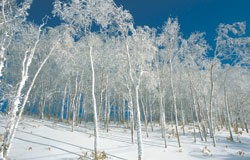 Hokkaido is excellent value for money that comes with mother nature’s own snow guarantee. Outdoor Travel Japan believes that our guests, be it skiers & snowboarders during winter, are explorers who wish to experience new mountains, new cultures & new people & we have taken great care to incorporate many cultural, festive, scenic & non-ski activities that we know will compliment your holiday & give you a balanced perspective of the beauty, charm, mysticism & complexity of this new & exciting destination. Some travellers will want to ski the entire time, some will combine skiing & sightseeing. Many travelers will want an urban experience such as Tokyo or Sapporo while others prefer a thought-provoking exploration of traditional & imperial Japan in Kyoto. Whichever category you fall into, Outdoor Travel Japan has many suggestions for you, right up until the very hours before you board the plane for your journey home. Japan offers a unique blend of fantastic skiing opportunities mixed in with the marvels of the orient. In the pages that follow please find some information about some of the resorts you will be skiing & some of the exciting experiences you can look forward to. We look forward to being your guides on this most exciting adventure.